By taking advantage of some unused space in their living room we were able to expand the bath so they could have a larger shower. Then by switching the location of the vanity and toilet we improved the layout. Finally a pocket door solved the space issue they were having in their master bedroom and we added a door so the bath could be accessed from the living room. You can see in the pictures below our trademark blue drop cloths. We tape them down at the beginning of each project and they stay in place for the duration. Each day we cover them with cloth drop cloths to catch and dirt and debris. The cloth drops are removed at the end of each day and shaken out. The work area is then swept and vacuumed and tools and materials are returned to their designated storage area. With demo complete we could focus on getting the new walls up and building the shower. 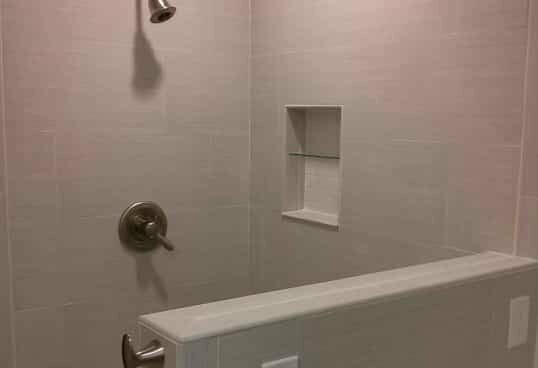 We build all our shower with Schluter Systems water barriers, pans and drains (that’s the orange stuff you see in the first photo above). Many showers develop mold behind the tile due to improper construction and moisture management. Using Schluter water proofing products ensures that mold won’t be an issue in this bath. The Smart’s choose a modern, large format, tile for their master bath remodel. We sent them to one of our favorite suppliers, Sellar’s Tile. Sellar’s has the largest tile showroom in Tallahassee and they are excellent at helping customers navigate the myriad choices out there. Plumbing and electrical work must be done my licensed sub contractors. For years we’ve worked with Mark McKinney Plumbing and Greg Tressel from Precision Electric. We can always count on Mark and Greg to not only do quality work but to get the work on time and in concert with the work plan for the project. The glass shower doors were installed by Miller Glass, the vanity by Cabinetry Design Studio and the stone counter by Southern Tops. We create a tumblr blog for each of our projects to record progress. They are created onsite daily and unedited.